Under the Influence is a site-specific performance and installation that is part of an ongoing series by Juan Miguel Marin. For this iteration, Marin has pre-recorded Brooklyn soundscapes and conversations. These recordings will act as a departing point for the artist, who will paint the mural while listening and meditating on the sounds. The end result is a spontaneous visual representation of the Brooklyn soundscape, imbued with the energy and diversity of the city. The soundtracks used by the artist will be available for visitors to listen to while viewing the work. Juan Miguel Marin is an Ecuadorian artist based in Brooklyn, whose sphere of work and influence bleeds across visual art, design, music, and film. Marin’s Drawing Under the Influence in fine art drawing offers a study in a meditative process of sentient creation, each piece representing part of the artist’s past or envisioned future. 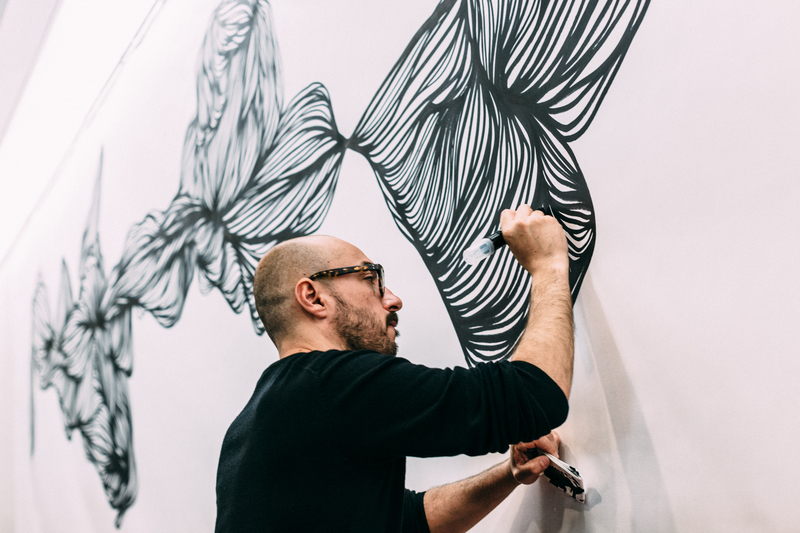 His art has been exhibited throughout galleries in New York, California, New Hampshire, North Carolina and his live performance drawings have been a part of events in cities across the world.